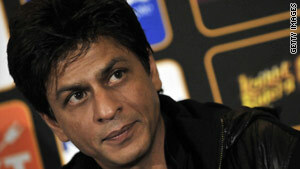 (CNN) -- Shah Rukh Khan, the Bollywood superstar, has become more than a little accustomed to being adored by millions. "I don't want to be anonymous... I'm very honest about that. I love being recognized, I love people liking me, I love the fact that people scream when I go out. I think I'll miss all that when it's taken away," he told CNN. But earlier this year comments by Khan, the owner of the Indian Premier League cricket team Kolkata Knight Riders, caused a storm of controversy and attention he didn't want. Khan questioned the lack of Pakistani players in this year's competition, and Indian Hindu nationalist party Shiv Sena interpreted the comments as inflammatory. Threats were made to boycott his latest film and some activists made some threats against him and his family's safety. "It just went onto a political agenda platform, onto an activist platform. I'm not on the same playing field. I'm an actor, I'm not a politician," he said. "This was my point of view... it wasn't as if I was saying something new. I didn't know it would cause so much trouble, and especially when a film was releasing, you don't want that kind of trouble. It just went completely through the roof." Khan is keen to keep his roles as an actor, cricket team boss and icon for millions as far from the political realm as possible. His face is one of the most salable in India with his image used in a raft of adverts and supporting products. Yet his recent film "My Name is Khan" did touch upon religious sensitivities, striking a chord among cinema goers in Muslim countries across the world. In the film Khan, himself a Muslim, plays an autistic Muslim immigrant in American soon after the terrorists attack on September 11, 2001. "I really thought the film was about humanity. It's not about Islam, it could have been about any religion to be honest," he said. "But I simply thought we made a film about humanity. I knew it would do well but I didn't know it would this well because it is a very niche sort of a subject."